The GoPro Motorrad Grand Prix Deutschland sees three riders step in as replacements, each with varying levels of experience on their bikes. Claudio Corti (Athina Forward Racing), Michael Laverty (Aprilia Racing Team Gresini) and Hiroshi Aoyama (AB Motoracing) have all been called to Germany to replace riders for a variety of reasons. 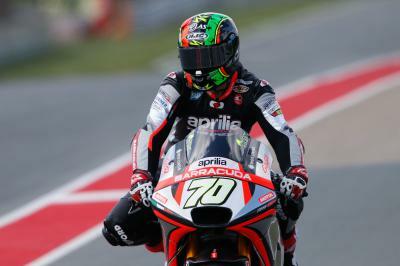 In the case of Corti and Aoyama this is to replace the injured Stefan Bradl (Athina Forward Racing) and Karel Abraham (AB Motoracing) respectively, whereas Laverty has been brought in due to Marco Melandri and Aprilia terminating their relationship on the eve of the German GP. All three of these riders have very little race experience on the bikes they’re currently riding but the trio are so far doing a commendable job, sometimes better than the riders they’re replacing. Of the three Corti has the least experience on his bike, the Forward Yamaha being completely new to the Italian. Corti and Forward Racing have raced together in MotoGP™ back in 2013 when the team ran a CRT bike. Friday finished with Corti in 25th, and last overall but this result is not as disappointing as it seems. 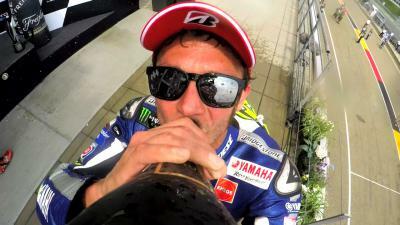 The enthusiastic Italian finished Friday with a 1’25.160, able to improve by over 1.5 seconds from FP1 to FP2. 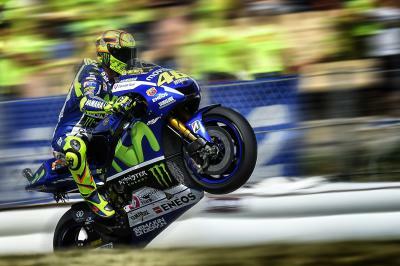 These are the sorts of steps forward one would expect on a new bike, especially having been away from MotoGP™, and racing, for as long as Corti has. Loris Baz (Athina Forward Racing) was 19th at the end of Friday and roughly two seconds faster than Corti, it’s important to remember that Baz has half a season of experience on the Forward Yamaha (including off season testing), compared to Corti’s two sessions. Before his injury, Bradl had been faster than Baz in recent rounds after a very difficult start to the season. Given the circumstances Corti is putting on a respectable display. Michael Laverty has been perhaps the most impressive on the opening day of practice, able to already lap within 1.2 seconds of Alvaro Bautista (Aprilia Racing Team Gresini). Both the Aprilia riders had issues in FP1 or FP2 limiting their time on the bike. Laverty does have some experience on the Aprilia MotoGP™ as he is the designated test rider, alongside his British Superbike duties, being instrumental in the development of frame upgrade and the seamless gearbox. However, testing experience is never as good as bar-to-bar hot blooded racing laps for truly pushing a rider and bike to their full potential. In just two sessions Laverty has set multiple times closer to Bautista’s than Melandri did in his entire half season with the Noale factory. In opening practice at Assen Melandri was 1.8 seconds slower than Bautista and a massive 2 seconds slower the round before in Mugello. In this context Laverty’s performance is incredible, able to already go faster than a multiple MotoGP™ race winner in a fraction of the time. Similar to Laverty, Aoyama is the official test rider for Honda splitting his duties between testing the Factory and Open bikes back in Japan. 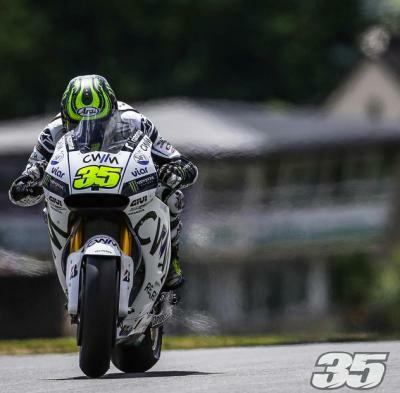 Of the three he has perhaps the most laps on the bike and has also raced twice previously this year, replacing Dani Pedrosa (Repsol Honda Team) in Austin, Argentina and Jerez although that was on the Factory machine. 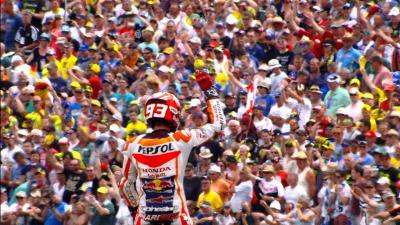 Today the former 250cc World Champion set a 1’23.925 lap to finish 22nd, the fastest of the replacements overall. Nicky Hayden (Aspar MotoGP Team) was the fastest Open Honda with a 1’22.935, leaving Aoyama one second down and therefore not only the fastest replacement but also the closest of the replacements to those on the same bike. With just two sessions under their belts, and both Laverty and Aoyama experiencing issues, there’s still a lot of learning for the three to do. Both Qualifying and the race on Sunday will be major tests for the trio with their main aim no doubt to close the gap to their teammates, or in Aoyama’s case the leading Open Honda. 12th a disappointing result for Cal Crutchlow on the opening day of practice at the German GP, big steps needed ahead of Qualifying. Moto2™ championship leader Zarco didn’t find the going easy on the opening day of practice at the GoPro Motorrad Grand Prix Deutschland. Experimentation was the order of the day for Dani Pedrosa, however the Honda rider is yet to touch the asymmetric front. Rabat: “I didn’t have any physical problems"
Eighth fastest despite a recently plated collarbone simply wasn’t good enough for Rabat, annoyed by a crash. Within half a second of the leader, but down in seventh position leaves Rossi with work to do. Gutierrez put in two brilliant laps at the end of Qualifying to take Pole from Red Bull MotoGP Rookies Cup points leader Bendsneyder. 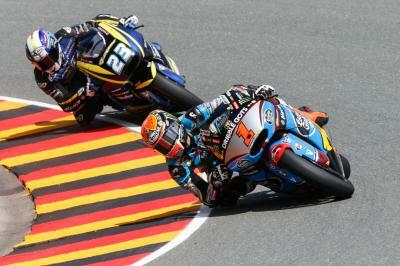 Front end problems have plagued Mika Kallio for much of the year, but at the Sachsenring he appears to have overcome them. 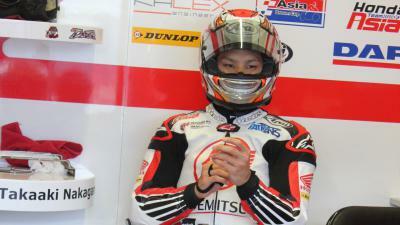 A welcome return to the top of the Moto2™ time sheets for Takaaki Nakagami at the German GP. Friday practice allowed Sam Lowes to test a new Speed Up frame, collecting valuable future data.